David Attenborough takes us on a journey to witness the behavioural patterns of our amiable furry friends. From not seeing the series on the ABC I can safely say if watching the entire series, it is a good idea to break it up. Otherwise watching continuously could habituate the enjoyment of this grand journey. Attenborough communicates his knowledge and understanding of the mammal kingdom. His approach differs greatly from our own Steve Irwin, he is more clinical and only his professionalism permeates throughout the series. There are different areas covered by the series, such as the different type of mammals like tree dwellers, swimmers, plant eaters and the opportunists a.k.a omnivores. David has immense patience in waiting for these animals to appear and when they do it is with the voice-over explaining the facets of these creatures. There is such a variation in the chapters that viewing never becomes boring even for people with less ventured interest in this world. For animal lovers this is one of the best examples of animal photography that I have seen. There are even CGI scenes to illustrate how the extinct mammals looked and behaved. All CGI scenes are executed well albeit brief. Most of the series is different types of animals going about their usual tasks, such as eating, courtship, hunting and the mating. There is even some firsts in animal photography like a little camera put inside a Platypuses nest using opitc fibre. There was other times when this method of photography was used to amusing results. When David looks inside a Beaver nest the Beaver is not so happy knowing he�s being spied on and covers up the camera with some mud! This package is a good chance to see some of the most rare species known in this world and you may see some species that you have never seen or heard of before. Take the ant-eaters for example which are pretty unique in their own right. Some are more efficient than others at finding their prey and being protected from attack by these tiny insects. They aren�t particularly intelligent because of their lifestyle not warranting such talents. Probably the most appealing animal in the series is the Pyker, a small squirrel like creature, who scurries around in the Rocky Mountains. When it wants to warn others of its territory it has a kind of squeak, which to be perfectly honest wouldn�t scare a mouse! Some sections like this rise the standard and overall rating quite high, since these scenes of magic really make the series worth watching. Other mammals of note are the Beavers making their dams, which is extraordinary. They know when there is a leak from hearing the water running and swim to first locate it and then to find wood and mud to block it. This Dam creation enables many advantages to these creatures, such as being able to swim with relative safety to regions where there is food. These rodents like all, have special teeth to enable them to cut down trees and seeing these in action is something to marvel at! The mammals are the most appealing of all animals to people because we are mammals ourselves. The majestic Cat family will capture the attention of all animal lovers especially those with an affiliation with a feline friend. The dog Family will do the same although the dogs that are in the wild are nothing like the ones in our homes. David shows his knowledge with a dry sense of humour that is admirable. For example in Plant Predators he casually walks up to a Sloth and goes �boo� and because their reaction and alertness is so slow they wouldn�t wake from sleep in a tree even if it fell. To witness the survival tactics of such creatures certainly commands respect from viewers. 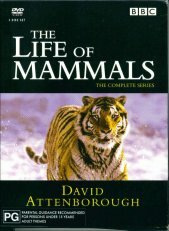 Viewing Life of Mammals will show that we are not the only smart creatures on the planet.